Download our union made grocery list now! Looking to buy union made foods? Download the checklist now! Looking for a union made beer? Download the checklist now! Looking for a union made condiment? Download the checklist now! Looking for a union made snack food? Download the checklist now! Looking for a union made soda or soft drink? Download the checklist now! Ethix Merch Your Trusted Ambassador For Ethical Commerce. Since 2002 we’ve been featuring wholesale promotional products made with respect for people and the planet. Here you can find branded promotional merchandise made in America, which supports union workers and the environment, and is never produced in sweatshops with unfair labor practices. 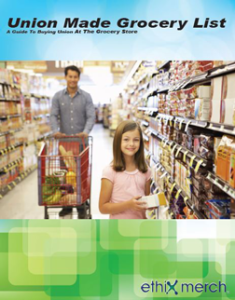 Get Your Guide to Buying Union Made Groceries!